We’ve also all heard about the importance of meditation! Laura just released: “Meditation ~ Magic & Miracles” which is a new downloadable package to help all of us learn, relax, and recharge with meditation. In this episode Laura teaches us a way to journal to increase our intuition. Laura Scott’s website is www.AncientStardust.com Enjoy this fabulous episode!! I have another fun and enlightening episode for you on http://www.wedontdieradio.com !! For 21 years, Laura Scott has been making a profound difference in the lives of thousands of people worldwide. 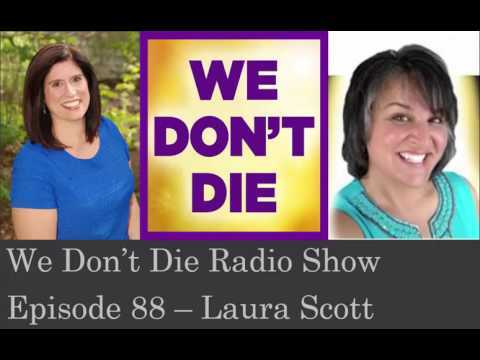 You may have heard of of the famous psychics that the celebrities go to, “Psychic for the Stars?” Well, Laura Scott is REAL DEAL. Laura is a world renowned author, psychic, spiritual teacher and channel for healing. She is warm, funny, compassionate and loving and a pure joy to listen to her words!